Finally after all the rain and misery we had in May, the sun is back and, dare I say it, summer seems to be on its way! And with sunshine comes my desire to make salads once again. Healthy bowlfuls of leaves and vegetables, drizzled with a light, summery dressing. Well, let’s not get too carried away. It’s not exactly tropical out there yet. 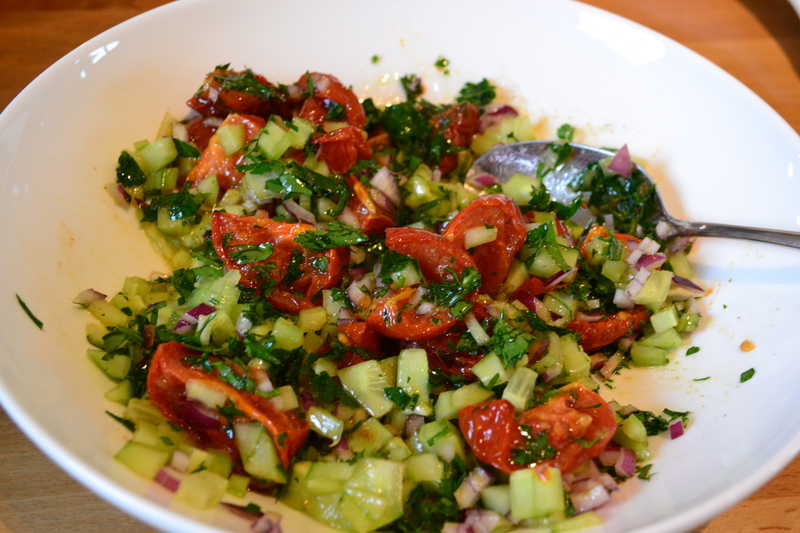 Today’s recipe, published in Olive magazine many moons ago, is the perfect interim salad. It gently eases us away from the stodge of winter into the light, swimsuit friendly meals of summer. It’s a warm salad (well, if you serve it immediately) and is seriously tasty with enough bulk from the quinoa and halloumi to make sure you’re full enough not to feel inclined to indulge in that left over piece of chocolate cake that’s been staring at you for the past 30 minutes…. Anyway, I digress. It’s a great quick, healthy and hassle free supper or lunch. I say healthy due to the quinoa. This (obviously) puts it into the category of meals that will make you live for ever. Well, perhaps not, but it’s not yet on the list of things that will kill you and, in spite of that, it’s actually very tasty too. I said this is a hassle-free meal and it really is. Roasting the tomatoes is the most time-consuming bit but aside from chopping them up and placing them in the oven you couldn’t exactly call it hard work. You’ll also need to dry fry the halloumi slices to given them colour on both sides. 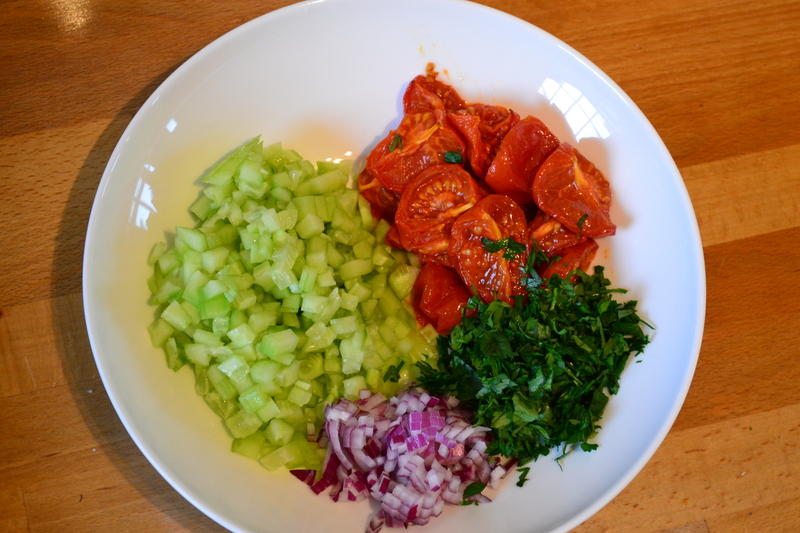 Then all that’s left to do is to cook up some quinoa, mixing it with chopped cucumber, red onion, and parsley, before adding the roasted tomatoes and tossing with a little cumin and olive oil. Yum. 1. Preheat the oven to 180°c/160°c fan/350°f/gas mark 4. Place the tomatoes on a baking tray, drizzle with a little olive oil and a sprinkling of salt. Roast in the oven for 40 minutes. 2. 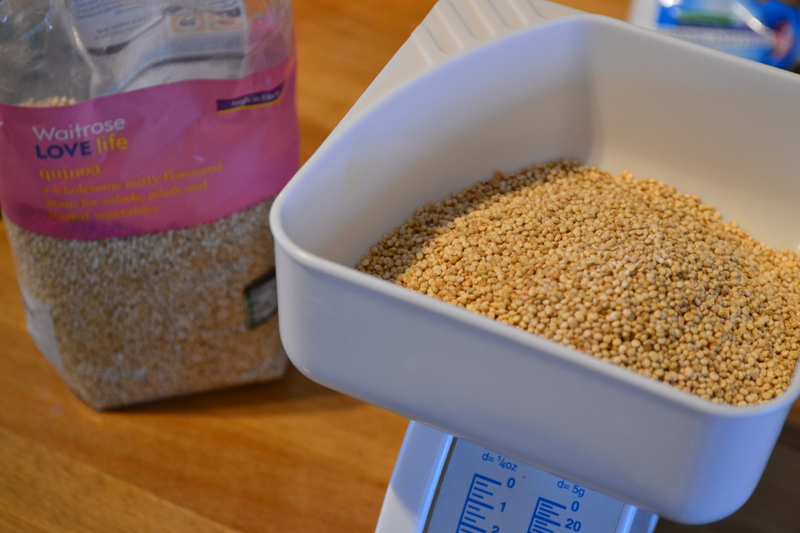 Meanwhile, cook the quinoa according to the packet instructions. Once cooked (the little sprouty bits will appear once it’s done), drain any excess moisture away. 3. 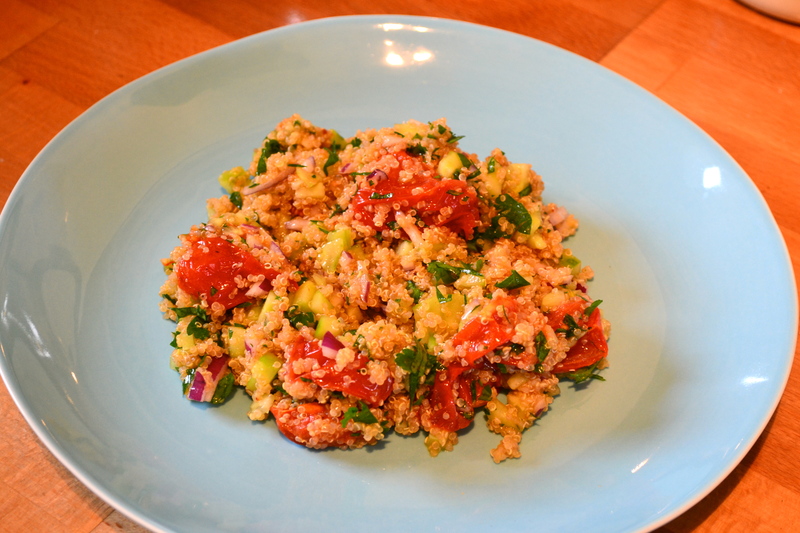 In a bowl, mix together the cumin and olive oil, then add the chopped cucumber, red onion, and (once cooked) the roasted tomatoes and quinoa. Mix well. 4. 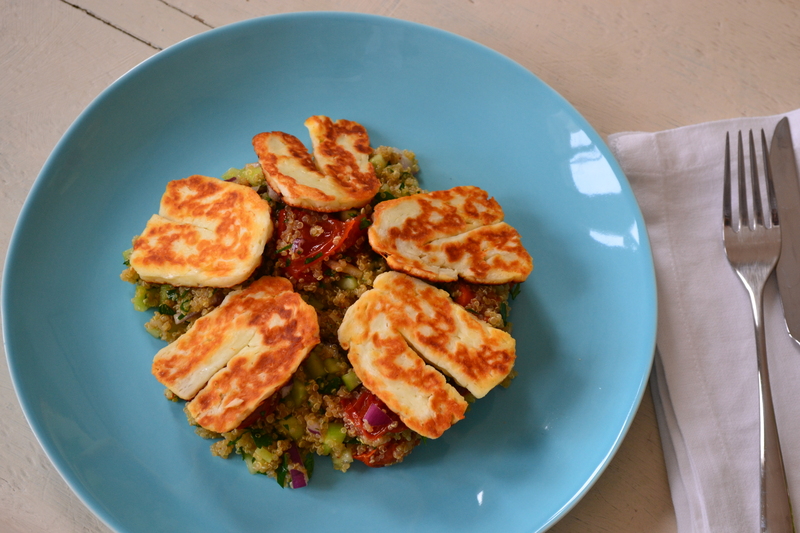 Heat a frying pan over a medium heat and add the halloumi slices. Cook for 2-3 minutes on each side until golden (the first side might take a little longer as any water in the halloumi will need to evaporate). 5. 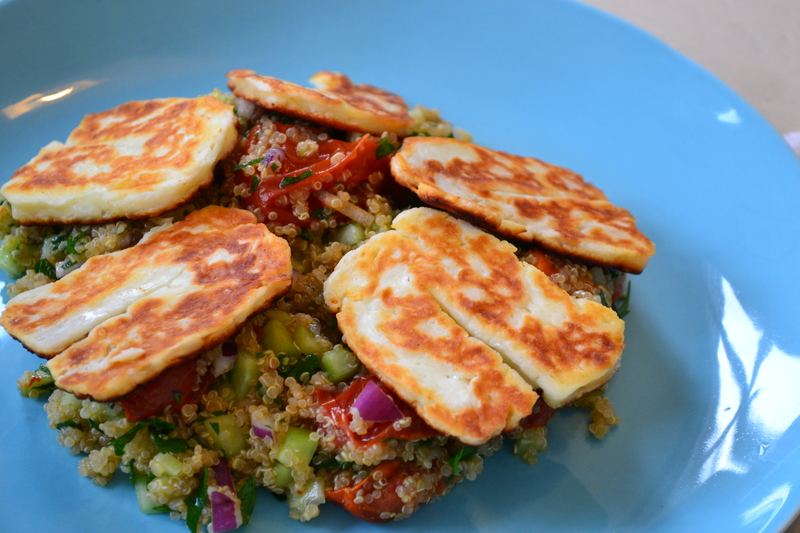 Arrange the quinoa salad on plates with the halloumi on top. Serve immediately. This looks delicious, the colours are gorgeous. I know what you mean about those little quinoa curls, they are pretty entertaining aren’t they! Thanks Jennie! Haha, I’m glad I’m not alone in finding quinoa entertaining! !